Are you sitting down? Good. You might want to swallow your coffee and set your mug down before you take a peek at this picture. 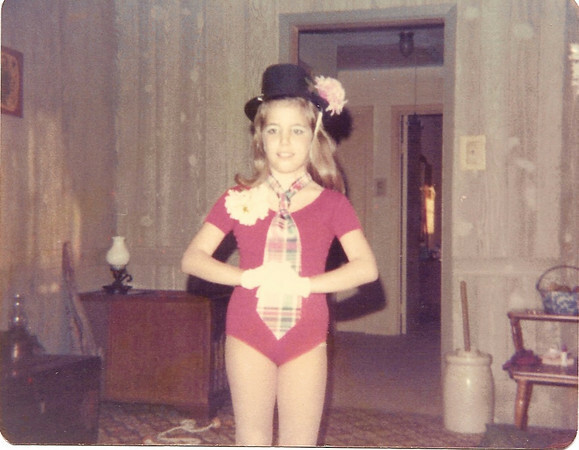 Since we are celebrating the end of Annelise's fourth year in dance with her recital this weekend, I thought I would show y'all pictures from my first, and possibly only, year in dance back in the day. Do I scream 1976 or what? 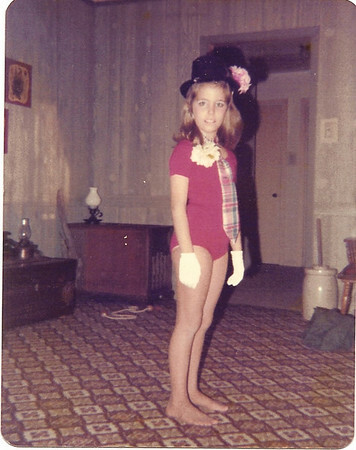 I don't remember the song I danced to, but I still remember my severe disappointment over the tutu. 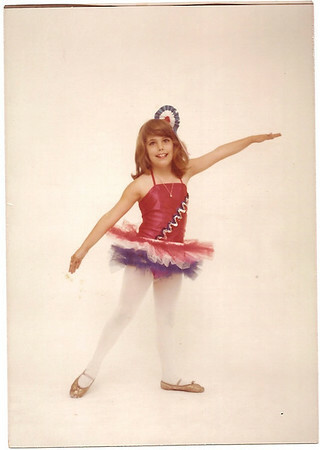 When my mom told me she had enrolled me in ballet and tap I was beside myself with joy over getting my very. own. tutu. I imagined it to be exactly like the long flowy one on the little ballerina that popped up in my jewelry box. Not only was it scratchy red, white and blue (Go America!) tulle, it stuck out completely perpendicular to my body. I may still be a little bitter. I also danced a tap number that required me to dress in some sort of pseudo-hobo attire (again, I have no memory of the song). Don't you love our carpet? I think it was indoor outdoor. Nice. I think the fact that my undies are peeking out ever so slightly just completes the overall ensemble, don't you? Peculiar sidenote: Annelise takes dance at the same studio I did. Isn't that sweet and kind of freaky at the same time? The recital this weekend is a review/celebration of the last 40 years of the studio. I am old. Love the pictures! I believe I might have some that are equally great only our carpet was shag and bright orange. I know... Is that a butter churn in the background? Take me back to 1976! These pictures are so funny, especially because I can see your now-self so well in them! This line is hilarious, "I also danced a tap number that required me to dress in some sort of pseudo-hobo attire. " Karen: We never had shag carpet though I secretly wished for some--now, EWWW! Yep, that's a butter churn. My mom was an antique junkie.